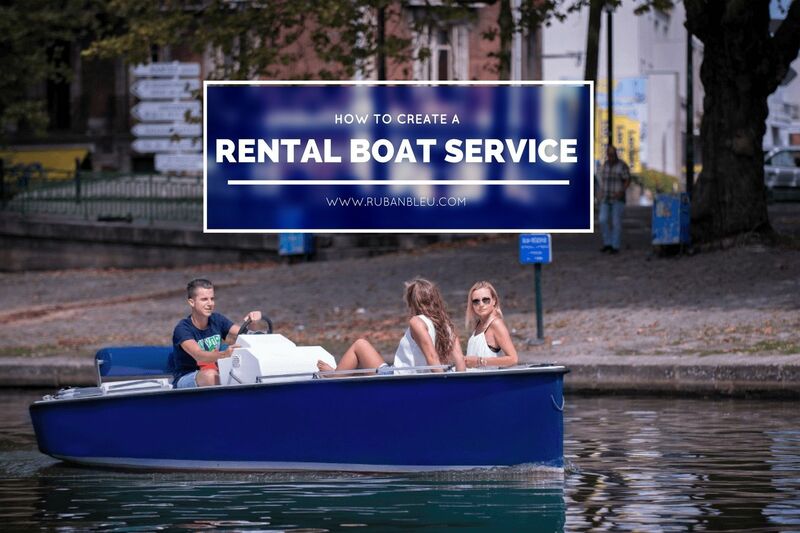 If you want to create a boat rental company, you are in the right place ! Owning a hire centre can be a good careerr change as well. This page will give you all our advice and will guide you through your business creation project. Waterway tourism market is increasing all around the world. Every year, many people just like you and me decide to create their own boat rental business. each year, Ruban Bleu supports about 3 to 6 entrepreneursin their creation process, providing 25 year of experience and advice through a defined strategy to ensure the success of their activity. Our clients usually start with a few of our licence-free boats and their clients rent the boats for periods between 30 minutes to a full day. In this article you will find the best advice that can be given to create your own boat rental company. Where to begin ? How to find the good place for your hire centre ? If you want to launch a business in the nautical sector, location is the most important thing. It doesn’t mean that it must be situated in a tourist area because in a few years, your rental business might have become the tourist attraction itself. If you would like to work in a particular city, you must think about the place with the most traffic and footfall. Ideally this should be A place where you can park easily and a place that is accessible by public transport. It is also better to have an accessible location for people in a wheelchair. Once you have chosen your location, you must determine how many people are willing to travel to come to your place. This step will give you an idea of the potential clients foryour future boat rental operation. 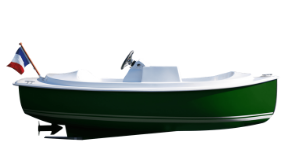 Our electric boats are only suitable for inland waterways, rivers and lakes. How to conduct the technical feasibility study for your rental business ? The chosen place is maybe not adapted to the creation of a boat rental company. Indeed, some areas are protected by government and not accessible for noisy or internal combustion engines. The feasibility study will define your project, your ideas and expectations. This document will be useful, especially to find investors or, on an other level, to find business angels, particularly if you want to franchise your activity. To define your forecast report, your market research will be invaluable. How to target the future customers for my day hire centre ? 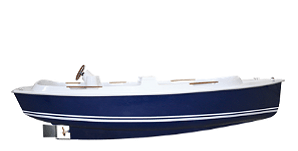 Families with children : You will need alightly larger boats. Create a family tour with interesting things to see for the children. You can create a story around the river and let them discover it during their cruise. 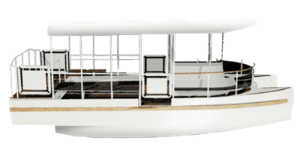 Groups and scout : You will need even bigger boats with a capacity up to 12 places. During summer you can offer water pistols, and think about discount prices. Seniors might be interested to know more about your city. Rivers or lakes were usually places that brought business and dynamism to cities in the past. History is everywhere and you must be able to find something interesting to say about it so do not hesitate to offer guided tours ! Fishermen : Prepare your boat for fishing, offer ice, bait, worms and make your place the best fishing spot for 100km ! 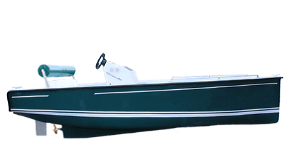 How to broaden the offer of my boat rental service ? If you want to reach more people, you must be visible through your communication strategy.We will come-back to this later in the last point. You can offer picnics on your craft with sandwiches, wine, beer or whatever. We created a boat adapted for picnics. You must think about the companies that might be interested to offer a boat tour to their employees or clients / partners. Approach hotels and other tourist locations by offering discounts to their clients. Think about all pertinent opportunities and possibilities. After targeting your offer, you must determine the break-even point ; the point where your activity starts to be profitable. It is essential to understand your business. Afterwards you can decide to offer half-hour, hour, 2 hours, half day or one day trip. If you are located in a specific place that require 3 hours and 43 minutes to be visited, why not !? 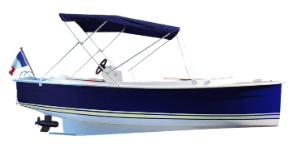 How to diversify my rental boat business revenues ? When you create your hire center, you should not concentrate your forecast profits only from boat revenues. You should consider other sources of revenues. You can create a small café or pub where you can offer something to drink and eat. Some of our clients even created restaurants or pizzerias. Other waterways activities could be bike rental, or other rental operations on river or lake such as renting Kayaks, Canoes, pedal boats, paddle boards, rowing boats or mini pontoon boats. You can set up an area where people could play board games or buy and read books. Once you have determined your offer, services and products, you can think about the investment. 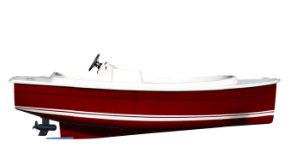 In what boat should I invest for a boat rental company ? Our best advice is to invest in electric boats. The first reason is economic : Charging a boat in France cost about 1€. This means that for 1€ you can offer a 7 or 8 hours boat tour. Compare this with offering a conventionally powered craft for a day which will cost you between 20 and 50 euros. The second reason is ecological : Your company can take benefits from a green image and develop a moral and ethically based business. Moreover, our lead acid batteries, one of the most ecologically problematic component in the past are now 99% recyclable. 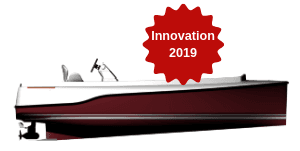 If you have already got rowing boats, why not electrify them as this can be a good solution to refresh your business base, offering new possibilities to your clients to venture further afield and rediscover the area. What are the secondary investments for a hire boat ? If you don’t have a dock to moor your boat, you will certainly need a pontoon if you don’t dry-dock your boats and equipment. According to your target and positioning, you must market your boat rental activity differently. Define the communication and marketing budget for your hire boats. This business is usually seasonal, will you promote your boat rental only in the summer ? No way ! The First step is to create your company website, to present the different activities on board ! For a limited budget, you can use Wix, a free website creation platform. For a slightly higher budget, you can create a website using the wordpress template. A wide choice oftemplates already exists. For higher budgets, why not use a communications agency where you will get advice on all aspects of marketing. Create a social network page for your rental boat company : Facebook and Instagram are the most suitable for such an activity. Secondly register on Tripadvisor, foursquare. If you develop a huge fleet, why not subscribeto a website such as booking.com or Airbnb. Do not hesitate to contact us for further information. We have developed a programme that helps people that want to create their boat rental business.